Above : Despite a complete lack of snow, the Scottish Olympic hopefuls pressed on with their training session on the sunday morning. An impressive turnout from the Fordell staff this weekend with a total of 17 helpers over the two days to assist with a couple of big events. First up was a visit from a local youth football club (Kelty), who arrived on saturday lunchtime for 4 hours of activities. Most of the site's activities were on offer and despite the threat of rain early on everything went well before the early demise of the sun just before 5pm called a halt to the fun. A total of around 80 youngsters took part in the day, along with a healthy group of club coaches, helpers and parents. In between bases, each group had the chance to have some food which had been prepared by the adults - the first group of kids rather amusingly helping themselves to all the meat sandwiches and leaving the rest with the less-popular cheese ones. After 4 hours of activities the group moved to the wet weather hall where the club coaches had an award ceremony to give out the season's trophies. 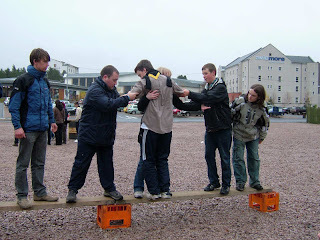 Above : All shook up - young Elvis fan gets carried away during team-building base at Aviemore. 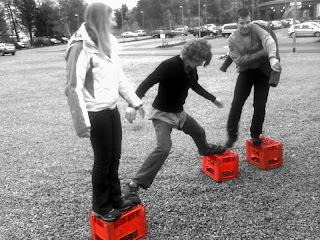 On the sunday, the staff split into two (not literally of course) with 8 going up to run a teambuilding session at the Scottish Scout Conference in Aviemore and the others taking care of the usual work on site. 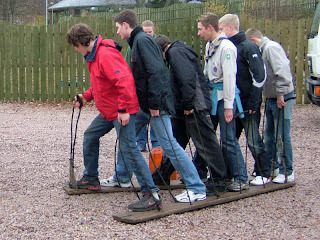 After an unheard-of early departure of 7am, the teambuilders arrived in Aviemore just after 9am and set about setting up their equipment in the carpark of the hotel. From 10am till lunchtime the staff entertained nearly 100 youngsters who were taking part in the conference with 5 different bases requiring various forms of teamwork, agility and balance, while a bemused long-distance lorry driver watched on in wonder. Above : Innovative youngsters demonstrate their idea for the new Forth crossing to interested politicians. After lunch, the Fordell staff participated in the 'marketplace', where a number of different activity centres and organisations had the opportunity to showcase their products and services in the main exhibition area of the hotel. A fairly sharp exit was required in order to get back down to the site and finish off a few tasks, so it wasn't possible to catch the end of the conference, but most of the staff had the chance to wander round the other bases and stalls in the hotel first. Arriving back at Fordell just after 4pm, the teambuilders were pleasantly surprised to find most of the jobs already completed, leaving them with just the task of checking that the tea urn was still working properly and performing a statutory taste test.